At ArtFactory.com we make fine art quality custom chandeliers in any size, style or theme. These custom lighting fixtures are made from only the highest quality, all natural materials, and are handmade to fine art specifications by our master craftsmen. Especially relevant is that all of our lighting is UL listed. 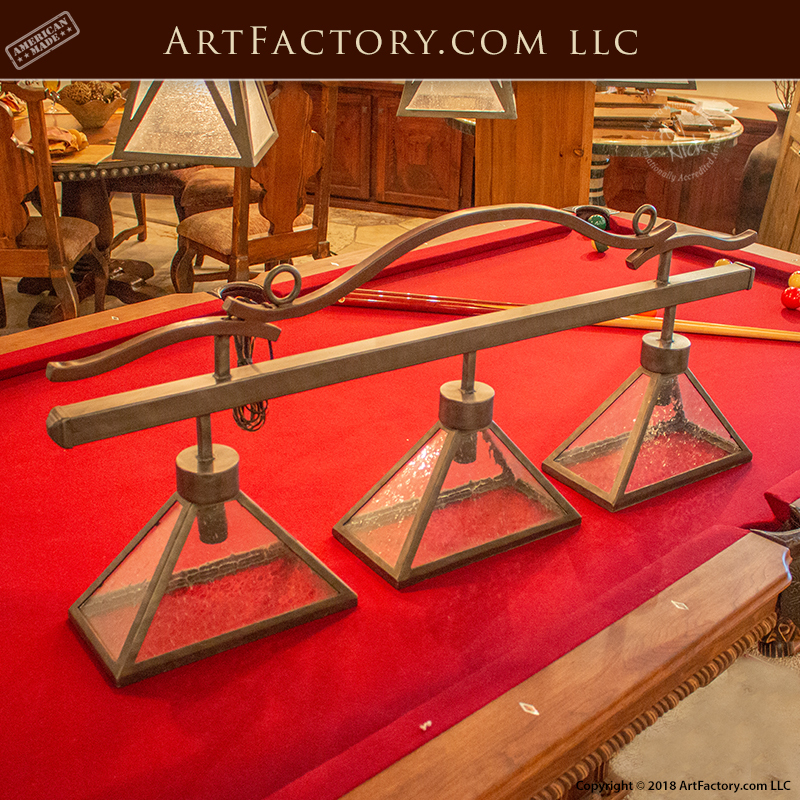 This pool table pendant lighting is crafted from solid, blacksmith hand forged wrought iron. This classic style chandelier perfect for any billiards or game room, and will provide the perfect amount of light to highlight the reliefs of the carvings on any of our fine are quality, master hand carved pool tables. Furthermore, like all of our products, this pool table pendant lighting was designed by, and built under the supervision of award winning artist H.J. Nick. Every item that leaves our world class facility is signed by H.J. Nick as a certification that it has been found to meet world class fine art qualifications. This includes our hand applied iron oxide patina finishes. These finishes are heat infused at over 1000 degrees Fahrenheit, so that the color actually becomes part of the metal. This adds up to a finish that will last for generations, and require little or no maintenance. This means that this is not only the perfect lighting fixture for your game room, but is also an appreciable asset with future investment value as an antique. When you order custom theme chandelier from ArtFactory.com, your options are limited only by your imagination. We can make your custom lighting fixture in any style of your choice. In addition to billiard room lighting, we also offer western style, craftsman lighting, antler chandeliers, nautical themes, and we even make Tiffany Lamps in original hand hand craft. Furthermore, we have no limitations on size. We can also design custom lighting from any picture or drawing that you provide, or recreate any design from history using period correct methods and materials. In addition to wrought iron, we also offer pure copper, brass, and even precious metals at your request. All of our custom lighting is handmade by master craftsmen, and is never mass produced, cast, drop forged, made from a mold, or any other fast process. This assures that your custom lighting fixture an original work of fine art. Each piece is a one-of-a-kind that will never to be exactly replicated. Call for pricing on pool table pendant lighting, or get started on any custom lighting design today by calling 1-800-292-0008 to speak with one of our engineers. Our combination of fine grade materials, and master craftsmanship allow us to offer a quality of product that is unmatched anywhere at any price. To top it all off, we are so confident in the quality of our products that we guarantee everything forever. Design your dream lighting today (no extra cost). If you find something you like, just show us a picture and we’ll help you create it! Sizes, styles, and designs are limited only by your imagination at ArtFactory.com. ArtFactory.com is a handmade in America custom lighting, door, gate, and furnishing manufacturer based in Scottsdale, Arizona, and featuring designs by H. J. Nick. We have been designing and building some of the world's finest furnishings for interior designers with ordinary clients as well as more prominent and successful individuals, C.E.O.s, leaders, royalty and celebrities for over 100 years. Most of our clients want custom handmade products that have a BIG WOW factor and elegance, and all want investment value and products that make a proper statement reflecting their personality or the ambiance of the environment for which it is intended.